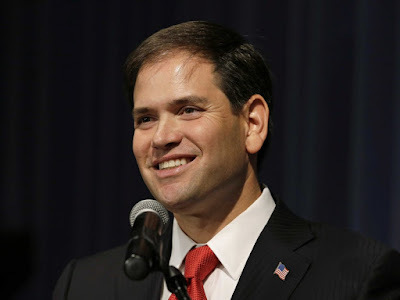 Tales from a tribble: Senator Marco Rubio, R-FL, Stands Tall With Israel! Senator Marco Rubio, R-FL, Stands Tall With Israel! Note: As you read this post the fetching Mrs. B and I will be at some undisclosed place on vacation. The place we are at cannot be pried from my lips or my fingers. Yesterday, Florida Republican Senate candidate Marco Rubio was asked if he would support a preemptive strike on Iran's nuclear facilities by Israel. Rubio responded: "Israel has to do whatever Israel needs to do for their own national security. You would hope the United States, by taking a stronger role, would prevent that from needing to happen. But ultimately, I don’t think any of us are going to blame Israel if they take it upon themselves to ensure that the security and well being of their people is safeguarded." Today, April 11, 2011, in a statement celebrating Israel's independence, Rubio expresses "grave concerns about the direction of current U.S. policy towards Israel." This from the Washington Independent in November 2010: Marco Rubio heads to Israel after winning senate race "Right after winning his senate election race, the first place Marco Rubio traveled to was Israel." Senator-elect Marco Rubio (R) will head to Israel on Sunday, reports Israeli news site Ynetnews: "With victory in the congressional elections less than a day old, Florida Senator Marco Rubio (Rep.) who considers himself a ‘Tea Party’ member, is set to arrive in Israel on Sunday. Rubio’s visit so soon after the election win is a move that strengthens assessments that the congress in its current form will continue where it left off – at least where Israel is concerned." Rubio gave a speech on Israel in June 2010 to the Republican Jewish Coalition “about the need for the United States to stand with Israel without equivocation or hesitation,” criticizing the Obama administration’s handling of the U.S.-Israel relationship. He also called on the U.S. to "move its embassy to Jerusalem" and said that the administration should not push Israel to a settlement freeze before negotiations. "Like America", he said, "Israel is an 'exceptional' nation". Jennifer Rubin of Commentary called it the best speech on Israel “since George W. Bush went to the Knesset.” "His belief that the U.S. should support Israel unequivocally jibes well with the Republican Party’s foreign-policy thinking on Israel." "As we work to reduce wasteful government spending," wrote Sen. Marco Rubio in a letter to Mitch McConnell on Thursday, "we recognize that providing for the national defense is a constitutional responsibility of the federal government. Therefore, we must continue to prioritize the security of our nation and the security of our allies, including Israel." Thank you Sen Marco Rubio for your strong complete support of Israel. I will be proud one day to call you President Marco Rubio. Every blessing Senator Marco Rubio! Choosing to stand with Israel!